I was born in Sydney, Australia and grew up across both sides of the country in Melbourne and Perth. For secondary school I attended Haileybury College and later completed a Bachelor of Science and Bachelor of Mechanical Engineering double degree at Monash University, graduating with First Class Honours. While studying at university I enlisted in the Australian Army and completed the Officer Training Course over two years, subsequently serving as a Lieutenant and Platoon Commander in the Royal Australian Infantry Corps for a further three years, including a stint as Assistant Adjutant at 5th/6th Battalion, The Royal Victoria Regiment. After graduating from university I traded hemispheres and moved to Zürich, Switzerland to pursue a career in the energy industry. I first worked as a development engineer for ABB Power Generation, where I designed steam and gas turbine components. I later worked a project manager for ALSTOM Power and was responsible for a delivering several power plant development projects around the globe. I left Switzerland in 2004 to complete an MBA degree at the University of California Berkeley in the San Francisco Bay Area. While at the Haas School of Business I organized the annual UN Industrial Development Organization conference on campus in 2005, and consulted to the UN Hunger Task Force in Ghana as part of the school’s International Business Development (IBD) program. I was also a member of the Consulting Club, Wine Club, Net Impact and the Rugby Club, and was a Haas Student Ambassador for the Admissions Office. In the summer of 2005 I interned in the Corporate Development department at Deutsche Post World Net (the parent company of express mail and logistics giant DHL) in their global headquarters in Bonn, Germany. My responsibilities there included development of the company’s climate change strategy worldwide – a fascinating project that I really enjoyed. I graduated from UC Berkeley in May 2006 and took a “gap year” of sorts to travel around the world, covering Eastern Europe, the Silk Roads across Central Asia, and the southern end of South America (Viva Argentina!). I headed back to the US in March 2007 to begin a career in management consulting at Bain & Company, Inc. in San Francisco, which is where I live now. While working at Bain, I’ve spent substantial time in the company’s Madrid and New Delhi offices, and took advantage of the company’s emphasis on work/life balance by taking a two month leave-of-absence. In the second half of 2011 I chose to leave Bain, and took nearly a year off to unwind, relax, travel some more, and decide what to do next with my life. I started a new career in 2012 at Intuit, Inc., the San Francisco-headquartered software company, in a global corporate development/M&A role which has lately evolved into a position running business development & strategic partnerships in the company’s international markets. 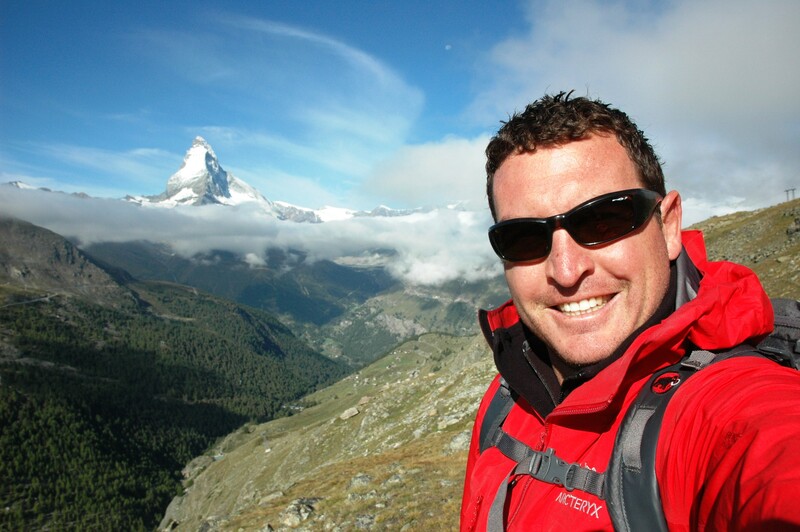 In late 2014 I left Intuit to pursue my passions around adventure travel and the outdoors and started a business called Outside Ventures to provide consulting expertise and other professional services to companies in these industries. I’m an avid traveler and have been to over 80 countries throughout each of the continents (with the exception of Antarctica). I’ve documented many of those trips on this site – some better than others I admit – and will upload photo albums to a photo sharing site as I pull them together. I’ve summarized some of my favourite places here. I’ve always been a big lover of hiking, camping and the outdoors, harking back to my time in the Scouts in the bush and mountains of Australia. When I moved to Switzerland I had the opportunity to take that passion to the next level in the Alps and acquired skills to take on more technical mountain terrain, starting with basic glacier travel and then moving to alpine climbing. Over the years I’ve had the privilege to climb some peaks in some of the most notable mountain regions of the world such as the European Alps, the Himalayas, the Andes and Southern Patagonia. I’ve summarized some of my mountaineering experience here. Another of my passions! I started playing rugby at university and quickly fell in love with “the game they play in heaven”, later going on to captain the Monash team. In Switzerland I continued my interest in rugby at Rugby Club Zürich (now Grasshopper Club Zürich) and went on to captain the North Switzerland regional selection team in the European competition. I also played international test rugby with the Swiss National Team for three years. After putting rugby on the back-burner for a few years while I went to business school and got settled in to San Francisco life, I most recently played Division I in the US with the Olympic Club in San Francisco. However, following a number of injuries (and surgeries!) the time has sadly come to hang up the boots. I’ll continue my lifelong affiliation to the game through refereeing, coaching or committee roles, but my playing days are done. Unfortunately I only joined the digital era a few years ago so I don’t have any electronic photos from my trips before then (I plan to get some of those photos digitized and on here soonish). I first used a 4MB Nikon Coolpix 4300 and now use a 6.1MP Nikon D70s digital SLR with an 18-70mm Nikkor DX lens. For happy snaps I first bought a 7.1MP Canon PowerShot SD800IS, which I liked with its 28mm wide-angle lens. I’m now onto a Panasonic Lumix DMC-FH25, which is a great camera apart from the fact the lenses seem to attract dust far too easily. Update: The Lumix dust issue became too severe, so I now have a Nikon Coolpix AW110 outdoor/waterproof camera which is definitely durable but suffers from average optics. Further update: The time has come to replace my DSLR and I eventually landed on the Olympus Micro Four Thirds mirrorless range of cameras, buying the O-MD E-M10 with the Pro 12-40mm (24-80mm) f/2.8 lens, which I love so far.